1) Friendly's may not make a great salad, but they sure know how to fry. The secret of finding a good meal in an unlikely establishment is to try and figure out what they do best. Sometimes a cooking method is included in the name of the restaurant like Dinosaur Bar-B-Que, where you stray from the slowly-cooked pit-to-plate meats at your peril. A lot of food at Friendly's goes in the deep fryer. And that's a good thing. 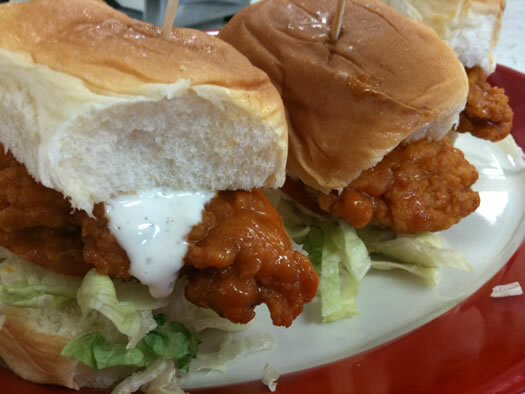 At its heart the Buffalo chicken slider is a deep fried chicken strip. Let me tell you, the crust on that chicken is impeccable. It has a palpable crunch and good flavor. The chicken on the inside is solid white meat, and remains moist and tender. But a well-fried chicken strip is nothing on its own. 2) The components, while not great on their own, become great when combined. This is the definition of synergy. And in some ways it reminds me a lot of the Dahi Puri -- it's all about textural and flavor juxtapositions. The slider's Hawaiian roll is subtly sweet and impossibly soft, but it's been toasted on the griddle, so it also benefits from the Maillard reaction. The Buffalo sauce has a classic Frank's Red Hot and butter profile, which is more about its dominant aged cayenne flavor than heat. Rounding out the acidic hit of the vinegar is a creamy and equally assertive blue cheese dressing. One slice of an unremarkable tomato adds the notion of juiciness, and a whole lot of industrial looking shredded iceberg provides a surprisingly fresh and cool crispness. When it comes together, it's hot and cold, crispy and crunchy, sweet and pungent, meaty and vegetal, creamy and chunky, hard and soft, all in the same bite. 3) When you order off-the-menu you don't know how bad it is for you. While I totally support the notion of putting calories on chain restaurant menus, it totally is a buzz kill when you want to go out for a treat. You know, like fried chicken, slathered in butter, with a creamy dressing on a sweet enriched bun. Or, for that matter, their Loaded Waffle Fries which at only $5 provide a heart healthy 1670 calories. 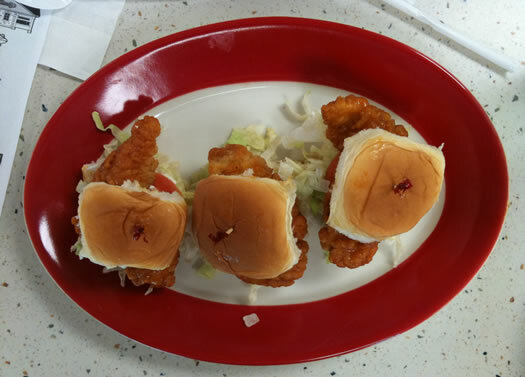 Luckily Friendly's changed its menu recently, and these Buffalo chicken sliders were removed. Do not fret, this is very good news. Now you can order them with a clean conscience. Just this past weekend I asked for them at the Guilderland location and the waitress immediately assured me it would be no problem for the kitchen to make. You do however need to specify blue cheese, because otherwise the default is ranch. I know, it's unthinkable. The sliders come three to an order, and aren't cheap at $8.29. While they may be diminutive in size, I assure you they are not short of calories. It's more than a reasonable meal for an adult of any size. Just take small bites, and if you are still hungry, you can always fill up on one of those outsized sundaes. The storm over that particular Friendly's was not due to the impending bankruptcy. In my humble opinion, the Heavens must have stood still as the angels took bets on whether or not you, Daniel B., were going to actually EAT A MEAL AT FRIENDLY'S!!! 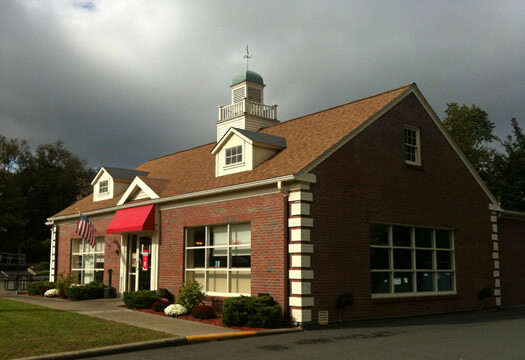 I am going to take one step back from Leah's sentiment and say that I cannot believe that, of all the Friendlys in the world, Daniel ate at that particular Friendlys! As a kid I loved Friendly's. Heck as a teenager I loved going there after high school orchestra concerts (being principal cellist was hard work and required ice cream afterwards, mostly to make me forget the sound of everyone else playing behind me). As an adult I don't know if even starvation would push me to consume anything on the menu (including the salads which are horrible. Why does any place use iceberg?) don't get me wrong I like a good plate of fried delicacies slathered with a worthy Buffalo sauce, but I haven't been in a Friendly's in my adult life that wasn't completely filthy. I cannot and will not eat or drink anything there or as take away. You ate at Friendly's, willingly? And liked it? Really? I'm confused. I'll admit, I liked Friendly's as a kid, mostly for the Reese's sundaes (we usually didn't get food there, just ice cream). But as an adult, I've come to realize that Friendly's is like Denny's with ice cream -- pretty much everything on the menu is not only subpar, but it's buried in at least two, if not three, heavy, fatty sauces. Bleh. We ended up at the LessThanFriendly's last summer as a compromise with a party of 11, 6 of whom were kids. The place was deserted. I falsey assumed this would mean quick service. In fact we waited a good 20 minutes after our drinks before a server took our order. The meals were brought out, staggered over the course of 45 minutes. And better yet, my grilled cheese was frosty cold in the middle. So no, I'm not surprised their recent campaign of high-fiving (just in time for flu season) failed to bring them back into the black. Maybe Friendly's should re-organize into an ice cream only institution? The food went to hell long ago and the service has always been quite slow. I'll still miss it though, because I grew up a block away from one and had several friends in high school work there...and hook me up with free stuff. Anyone throwing down the trash talk about Friendly's needs a little Fribble in their life. Stat! The last time I wanted to go to Friendly's was somewhere around the end of high school, 10 years ago... but I used to love it as a kid. I just learned of the 'Friendly's Express' stores they opened in MA... that sounds like a way better market for Friendly's to go after. Less diner-y, and more semi-fast-food (like Moes, 5 Guys, Chipotle, etc). Still with all the ice cream options, of course! Where have you gone, Daniel B? Capital Region food snobs turn their lonely eyes to you. Woo woo woo. I think its great you went to Friendly's and wrote a piece clearly explaining what it was about the place that you enjoyed. I think its great you didn't reflexively/blindly slam the entire place for being common. I think its great you demonstrated that something worth eating can be found in almost any setting, as long as people keep their order and expectations within the context of the establishment. Way to go, Fussy. Right on.